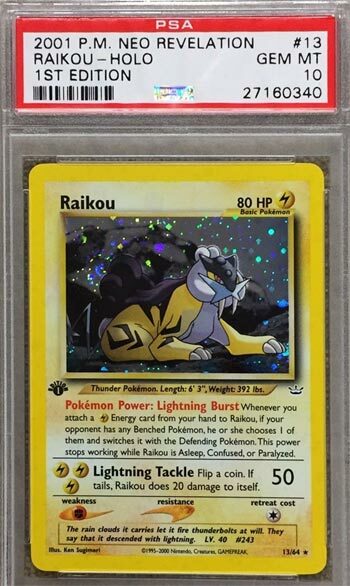 This 1st Edition Raikou from Neo Revelation is a hot card, especially when graded at PSA 10. This card sold for $2425 in October. Another PSA 10 sold for $1547 in October as well. As we write this, there are only 16 Perfect 10’s on the PSA Population Report. After this price gets out, I’m guessing more people will be sending their Raikous in for grading. Some quick notes on our rankings: These are all cards you could have reasonably collected in the United States. These are cards that appeared in Booster Boxes, Booster packs, Leagues, and/or Starter Sets. Pokémon TCG fans/players could have plausibly obtained these cards through auctions, trades and/or blind luck pulls. There are no cards “prize cards” in our list. All values are based on actual sales of Pokemon Cards on eBay in 2017. Most of these cards are Professionally-Graded, Gem Mint cards, which are independently certified on their condition. Here’s an article on Graded Pokemon Cards if you don’t know what Graded Cards are.